It's been such a whirlwind lately. We were realizing last week that it's only been a month since our Matilda adventure began. It feels like we've been involved with this project a much longer period of time. As of Friday the 27th, the parts car had been delivered to Chad's and waits for us to have time to disassemble it. Matilda is still sitting in our garage awaiting the various transplant procedures. The body hunt intensified over the weekend. We checked eBay again and saw there were three cars for sale in Montana. Debate ensued as to whether or not to pursue them and what all would be involved in picking them up. Then I decided to see if I could find some sort of n600 message board, and amazingly found one on Yahoo! We joined and posted a message to the group telling them we were looking for a rust-free body for Matilda, preferably in Oregon. Within 2 hours, we had a reply from Wayne in Redmond who said that yesterday his son heard of an n600 without an engine at a wrecking yard called Ira's in....Madras. We couldn't believe it! We called Gary's dad Jim and asked him if he wouldn't mind paying a visit to Ira and checking out the car for us. Next step: Rebuilding the engine! It's been a busy month! Matilda has been sitting patiently in our garage while we've been plotting and planning our next steps in her restoration. 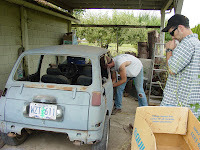 We've been looking around town and online for another parts car for Matilda, and thanks to Chad's help we now have one! 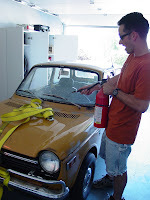 Chad has an amazing radar for cars, which lately has included 1971 Honda n600s. In fact, he was driving on Highway 20 by Blueberry Meadows when he saw out of the corner of his eye the tail light of a car that called out to him. What you have to understand is that this tail light was on a vehicle that was 100 feet off the highway, buried under a slew of boxes and other stuff in a carport, and Chad was most likely going at a speed greater than the posted 45 mph speed limit. So, Chad called Gary to give him the location, and then we sped out there after work. Sure enough, a little '71 n600 was buried under a pile of boxes and other miscellaneous stuff. We didn't poke around too much as no one appeared to be home, and there were two rather vicious hound dogs barking at us from behind the chain link fence. But, it appeared to be in decent shape, so we left a note and asked the owner to give us a call if he was interested in selling. We were at play rehearsal the next night, waiting to enter the wedding scene in the third act, when Gary's phone rang. The owner of the n600 was on the line and said he was definitely interested in selling. He had been traded the car a number of months ago, had hoped to restore it, but then got busy on other projects. We made plans to meet up over the weekend and see if we could come up with a mutually beneficial arrangement. We drove out there Sunday to look at the car. It wasn't quite what we were hoping for body-wise, but it had good parts, including a good passenger seat, doors, instrument cluster, various engine parts, and a comparatively rust-free hood. We made him an offer, and he accepted, even offering to tow the car over to Chad's for storage. He wrote us a receipt, promised to deliver the car by the end of the week, and that was that. Once we have a few spare hours, we can begin swapping parts out. Next step: A new body for Matilda. Saturday was the day we took Matilda to the DMV to transfer her Florida title and make her an official Oregonian. What an adventure that was! Gary hooked her to the truck using a tow strap, wrote "in tow" on the back in blue painter's tape, turned on the hazards, and off we went. 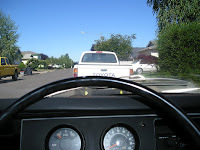 Although I didn't like either option, we decided that he would drive the truck and I would sit in Matilda to steer. Gary gently took off and we made the turn from Aster onto Country Club okay. When he hit 15 mph, I began to freak out. It was like a riding in a terrifying carnival ride with no seat belt, being pulled along in a tiny, rusty tin can. When Gary hit 25 mph, I though I was going to lose it. Making wild hand gestures and having a look of sheer terror on my face, I did my best to communicate to Gary via his rear view mirror to please slow down. Apparently I need to work on my miming skills because he mistook my hand waving as a desire for him to go faster, which he did. A short distance later (right before 35th street, a whopping half mile from our house), the toe strap broke. Hallelujah. I was relieved to be able to stop for at least a minute and let him know that 10 mph was going to have to be the max. Gary retied the toe strap and we took off with our now agreed upon top speed. 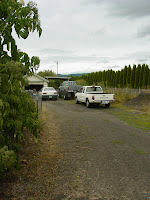 We tootled down 35th Street and onto Philomath Blvd. Fortunately, there was a large shoulder and we were able to stay in it so that we didn't totally muck up traffic. We made the turn into Avery Park, and navigated its speed bumps and windy road just fine. When we got out of the park and were stopped at the light on Highway 99, we decided to switch spots. Gary now got to ride in Matilda while Simone and I drove the truck. We made it about a mile down 99 before we were pulled over by one of Corvallis' finest. He talked to Gary, took both of our licenses for a quick check, then kindly let us go with the understanding that we would not tow Matilda back home ourselves. We were relieved to not get a ticket! He probably could and should have told us to get a truck/trailer right then and there, but let us go and we slowly drove the last 3/4 of a mile to the DMV. 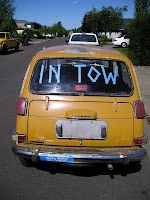 Once we finished all the paperwork and paid the necessary fees, we pulled Matilda down to the end of the dead-end street by the DMV (they tow any cars left there after 2pm on Saturdays), and then called a tow truck. It was worth the price of the tow to: a) not die on the way back home, b) not cause anyone else to die, c) not cause an accident, and d) not get a ticket. 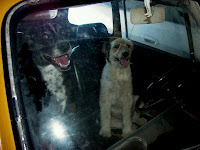 When we arrived home from rehearsal that afternoon, Matilda was sitting securely in our driveway, like she never left. Next adventure: removing the engine! It may be a few weeks though, as we're swamped with work and play practice right now. We'll keep you posted! Well, we arrived home late Tuesday afternoon and were excited to see Matilda after long last. Even though it had been less than two weeks since we decided we wanted to be auto restorers, it had felt like an eternity. Wednesday, Chad came over to help us assess and check out Matilda. We decided to try and get her started. After having charged the battery overnight, we found that certain things were in good working shape, but not the starter. So, we decided to pull-start it with Chad's Mercedes. But first we had to remove the old gas (in the gas tank for more than a year by our best estimates). Matilda's six gallon tank proved to be rather full, as four and a half gallons of stale gasoline were drained from underneath and poured into the readily available plastic milk jugs (side note: bad idea, but that's another story for another day). After introducing two fresh gallons of Safeway brand petrol, we gave Aster Street her first view of its newest and smallest auto inhabitant. With Chad's diesel ponies yoked for the task, Matilda was dragged skippingly down the street. We dragged her 87 feet or so with no result. Just as we were about to lose all hope, we hit the 88th foot and she actually fired and began to run. She managed a coughing, sputtering idle for upwards of 20-30 seconds before coming to a halt. It was then that we noticed smoke coming through the rust hole in the hood. With master instinct, Chad expertly deduced that a fire extinguisher would be of some use at this moment. I sprinted back to the garage, grabbed the nearest fire extinguisher, and then ran back to the smoking rust bucket that is our Matilda. A quick blast to the air cleaner and the fire's progression was halted. In an attempt to hide her from prying eyes, and stay out of the newspaper, Chad and I pushed her into the garage where she now awaits our next foray into her imminent resurrection.